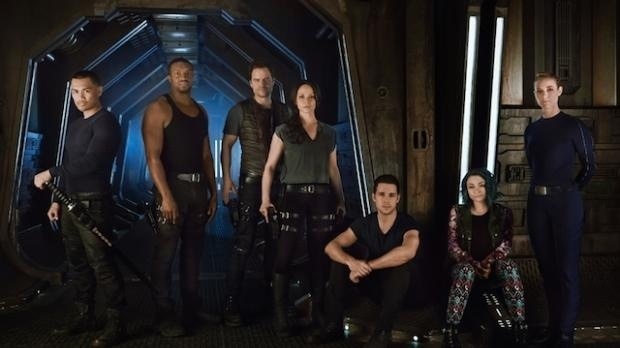 Dark Matter— Based on the comic book by a couple of the guys behind the Stargate shows (shameless plug for the recaps of those on this very website), this is about six strangers who awaken on a ship with no memory of who they are. Along with an android, they try to find answers for what has happened to them. While the reveal of who they are is a welcome turn in a choppy first episode (although that comes from setting up a lot of mysteries to solve later), the second episode is an improvement for finally letting us see what these strangers are capable of. I kept getting weird tinges of Stargate Universe in the show (and not just in certain elements of the production design), which is not a bad thing in this case, as I found that show rather underrated. As with most genre shows on Syfy, there’s some nice cross-pollination of actors from Lost Girl (we’ll get to another connection to that show later) and Continuum (speaking of, when are we getting the final season of that?) in the main roles in Dark Matter. The mysteries and characters seem compelling enough to stick around for the time being, but I’m hoping we get some answers to some of the big questions (like what is behind that giant door?) sooner than later. 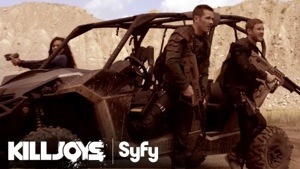 Killjoys— As I mentioned Lost Girl earlier, the creator of that has a spaceship-oriented show on Syfy too. Killjoys is about bounty hunters in the future, and surprise, the adventures trying to collect on those bounties. Between this and Dark Matter, this is the most laid back and fun of both shows. And if Dark Matter is like Stargate Universe, then Killjoys is akin to Firefly. As much as I like the first two episodes so far, its the universe itself that I’m curious to learn about. You got Dutch (the lone female protagonist) and her connection to some space League of Assassins, and the unionized bounty hunter system in which Killjoys operate in which are the most interesting aspects of the show so far. All in all, in terms of light summer sci-fi TV fare, both are good enough, but whether they’ll become great is something too early to tell at this point. But what are your thoughts on both or either shows?